I haven’t written about sounds for a while, and since my blog is all about the colours, sights and sounds of South India, it’s time to make some noise. The sound of drumming is a sound I hear often in my neighbourhood, especially since the festive season started with Ganesh Chaturthi. Processions carrying large idols of the god to the nearest lake for immersion are almost always accompanied by a posse of drummers drumming along energetically. A group of drumbeaters was hired by the Bruhat Bangalore Mahanagara Palike on Thursday to embarrass a tax defaulter on Indiranagar 100 Foot Road in HAL 2nd Stage. In a move to force defaulters to pay up the tax, the BBMP authorities drummed home the message by hiring a set of raucous percussionists to perform before Ramachittaranjan Das, who owns a four-storey complex in the tony neighbourhood, which has been leased or rented out to multinational companies. The owner of the property, a BBMP release said, has defaulted on property tax since 2007-08. The dues ran up to a whopping Rs. 72 lakh, and repeated reminders were fruitless. Thursday's initiative, however, was a thumping success. “The owner of the property has given us a cheque,” a BBMP official said. A large number of property owners in the city are tax defaulters, owing BBMP more than Rs. 200 crore. Such drumbeating programmes have been planned in 10 places in each of the eight zones once a week to mobilise funds. Though the Karnataka Municipal Corporations Act 1976 does not empower BBMP to beat drums, it allows it to issue notice and seize movable properties of defaulters, BBMP sources said. Hah! This one is a really good one! Am gonna share this! Would like to listen to this drumming here in Berin, Germany! And in today's The Hindu (24/09/2011) I read that the BBMP did it again in Jayanagar. This was effective as the defaulter has now paid an advance of 1 crore (10 millions) on the 11.14 he owes. 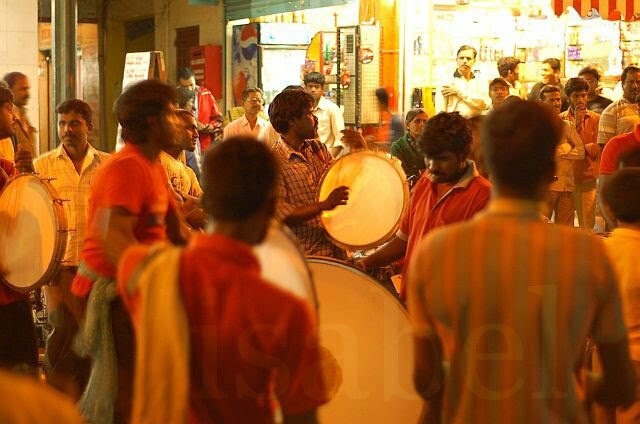 I'm not a big fan of drumming myself, living very close to a temple where on certain festival days drumming can go on until the small hours of the morning! But this tactic seems to work!